Common Names: Common Groundsel, Ragwort, Grimsel, Birdseed, Chickenweed, Old-man-of-the-spring. Brief Description: Similar to dandelions but larger and more menacing, groundsel can grow over a foot tall and spread quickly. If you took a dandelion, and gave it the gamma radiation that turned Bruce Banner into “The Hulk,” you’d have the Groundsel. Unlike the dandelion which tends to sprout only a single flower, the groundsel sprouts between 8 to 10 flowers and its tooth-like leaves sprout out in all different directions. Like their cousin the dandelion, the groundsel’s flower also turns into a seeded dome, but unlike the dandelion the seeds are more stringy, almost like an old man’s beard. Hence the nickname “old man of the spring. 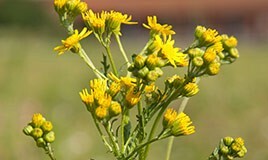 Groundsel is toxic to humans and livestock. Like other broadleaf weeds, it looks for weakened grass to make root. Groundel is particularly weak against thick and healthy turf roots, mulch, and anything else that prevents it from growing upward as the plant itself is not very strong. Groundsel can be prevented by strengthening the turf to choke out the seeds. As an annual plant that spreads through seeds, it can also be prevented by cutting off the flowers quickly, before they have a chance to seed. However, keep in mind that seeds last for over a year, and seeds may infest lawns from other yards/homes. It is also receptive to broadleaf weed control. If you’re in need of broadleaf weed control, call Green Lawn Fertilizing today. Our services can both prevent and cure groundsel and other broadleaf weeds.